"In this place, a poverty-stricken tribe lives on high terps and hand-built platforms, which raise their homes above the known high water mark. When the waves wash over the surrounding land, the inhabitants look like seafarers, but when the water subsides they have the appearance of shipwrecked people." That’s how a Roman officer described the people living on the shores of the North Sea. To him and his comrades, this was the edge of the world. In the sea, he expected to find fabulous monsters, and on land, savage barbarians. Every ancient author writing about the Low Countries, was preoccupied with the complete contrast between the civilized people of the Roman Empire and the tribes of noble savages or barbarians living outside it. Julius Caesar exploited this preconception to enhance his own reputation, boasting that he had overcome the "bravest of all Gauls"; Tacitus employed the same stereotypes when he described the Batavian Revolt; and, in Late Antiquity, the Franks were still described as resembling monsters. The reality was different. The presence of the Roman army along the River Rhine radically changed the way of life in the small Roman province of Germania Inferior, and the need to maintain and feed this large army became a significant incentive for economic change. The tribes living along the lower reaches of the Rhine and close to the North Sea gradually began to resemble their occupiers. 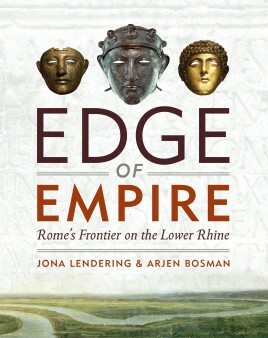 Historian Jona Lendering and archaeologist Arjen Bosman have combined their considerable expertise to create a successful synthesis of historical and archaeological evidence, in this history of Rome’s Lower Rhine frontier. Their award-winning book is now available in English for the first time. Jona Lendering read history at Leiden University (MA 1993), specialized in Mediterranean culture at the Amsterdam Free University (MA 1996), and worked at excavations in Holland (Riethoven) and Greece (Halos). After teaching historical theory and ancient history at the Free University for several years, he was one of the founders of a school for history teaching, Livius Onderwijs. Born in Amsterdam, it has now spread to auxiliary locations in Bussum, Dronten, Gouda, Hoorn, Leiden, Schagen, Zaanstad, and Zoetermeer. As of 2013, Livius Onderwijs has eight teachers, about 500-600 students a year, and offers tours to countries like Italy, Turkey, Iran, and Lebanon. The field trips help to etch into the students' minds some of what they've learned at the school.Because history is for a large part telling a story, something you do best in your own language, Lendering prefers to publish in Dutch journals. However, he has several times contributed to the Bryn Mawr Classical Review and is a regular contributor to Ancient Warfare. He is also the publisher and editor of the on-line publication of the Babylonian Chronicles of the Hellenistic Period, a set of important cuneiform sources for the history of the Seleucid and Parthian Near East, transcribed, translated and commented on by Bert van der Spek of the Free University Amsterdam and Irving Finkel of the British Museum. A publication as book is in preparation.Lendering is currently writing a book on the separation of Judaism and Christianity, and maintains a blog on ancient history and a blog in Dutch. He is the author of several books, including Edge of Empire and Consensus and Crises; some other bits and pieces can be found here. For the Livius website, which has received several awards, he collaborates closely with Bill Thayer of LacusCurtius. As an archaeologist, Arjen Bosman is interested in the coastal regions of the Low Countries and the military archaeology of the twentieth century. He is the owner of Military Legacy. "This is a thought-provoking survey that can be recommended to the general reader and the undergraduate student alike for its lively style, useful presentation of the literary sources, and clarity in presenting a complicated subject."